Costa Rica has many tourist attractions, where you can enjoy an unforgettable vacation. To visit these destinations in Costa Rica there are many options of travel, either by land or air. 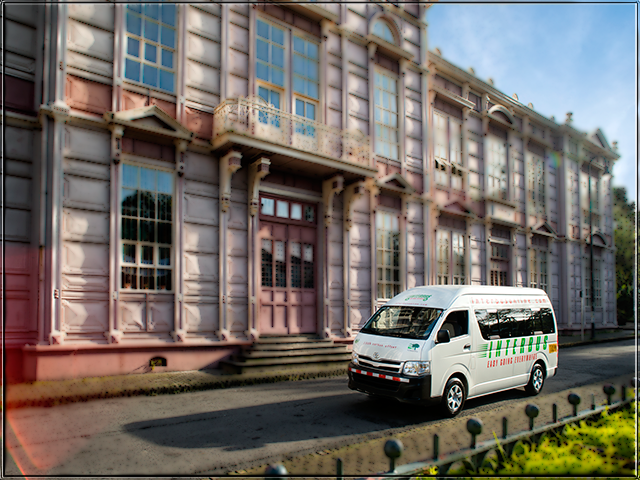 There are many tourist transportation companies which you can choose; always keep in mind that you must verify that the transportation operator has all the permits and insurance required by law in Costa Rica; this way you can avoid any inconvenience during your vacation. This is a collective passenger transportation; where the travelers have to adapt to the schedules and routes offered by the operator; Costa Rica has a good quality public transportation service at affordable prices; mostly buses, but also has a metropolitan train and ferry to the Pacific coast. Most buses leave from San Jose, Costa Rica's capital, to the different provinces from its respective terminal. If you decide to use the public service, learn all about the terminals, timetables and prices for your destination. The shuttle service or door to door service is an excellent choice for travel between the main tourist destinations in the country. It is a comfortable and reliable way of travel. Interbus offers this modern service in Toyota Hiace units, they are non smoking, air conditioned and hold only a few passengers; the main advantage of shuttle services are affordable prices; as the name implies, it is shared with other passengers, the charge is per person, and each route has an output schedule, which varies slightly depending on the hotel where you are staying or being used as a reference; It is important that you know that this type of service must be booked in advance, because Interbus works with the amount of seats available. When you make a reservation, you will receive a confirmation email with all the details of your transportation service. If you need more information or want to book a service, please click here. Private transport offers comfortable, safe and convenient service to travel anywhere within Costa Rica; this transportation programmed from most hotels and destinations in Costa Rica, it's the most convenient option when you want to save time, Interbus also offers this type of service, and it is a good option for people who want an exclusive transportation service. If you want more information or a quoting service, please write to Info@interbusonline.com; and they will be happy to help you. Costa Rica is a small country, but the transportation by land can take many hours, due to the state the roads are in and the traffic, for this reason the domestic flights can be the most convenient option and reasonable if you do not have many days in the country, this represent a considerable saving in travel time. There are two airlines SANSA and Nature Air, both offer regular flights to most important tourist destinations in Costa Rica; also they have flights to Bocas del Toro in Panama; and in the case of Nature Air, it also provides service to the Granada city in Nicaragua, during the high season; these flights are from San Jose and Liberia airports. The Sansa headquarters are located at the Juan Santamaria International Airport, while Nature Air is located in the Tobias Bolaños Airport in Pavas, both are just a few minutes from the city of San Jose. For more information about these companies you can enter to http://www.natureair.co.cr/ and http://www.flysansa.com/en/home.